This May, come and experience a weekend of creation. From May 17 to 20, 2019 (Victoria Day Long Weekend) join our dedicated team of artists to Reset, be Inspired, connect, Socialize, and be Empowered. RISE to the occasion! 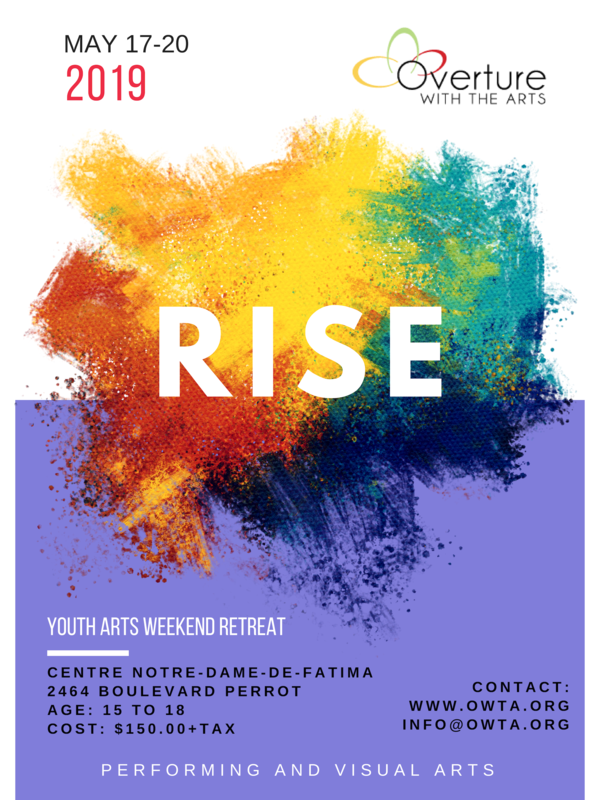 RISE is a weekend dedicated to equip youth ages 15-18 interested in the arts in a weekend of songwriting, music production and visual arts. You don’t need to be an artist or a musician to register! If you are interested in a creative career or a creative hobby, this weekend is for you! Guest speakers, interactive workshops in songwriting, music production and visual arts! Games, outdoor activities, campfire and music jams are just some of the fun things we will be doing in between! You will stay in beautiful cabins tucked in the woods of Ile Perrot. Cabins will be separated for guys and girls. Cost covers your lodging, food, and activities from the start to the end of the program. *Attendees are responsible for their own transportation. or email info@owta.org for the online option. Jimmy is a father, workshop facilitator, graphic artist, curator, and muralist raised in Montreal, Quebec. His work is inspired by the imaginative world of tattoos, graffiti and typography, manga culture and comic books, which has helped him create his unique aesthetic style and compelling high-quality illustration. Jason is a jazz guitarist who has been trained by renowned Toronto musicians and has played professionally for years. He also produces electronic dance music and has released songs that have garnered support from record labels, audio blogs, and many DJ’s. Danilyon is a songwriter and singer working both in Toronto and Chatham, Ontario (hometown). Last summer’s she was featured on a track called “By My Side” with Acejax, receiving three million streams on YouTube! Lisa is the program director for this coming youth arts weekend retreat. She believes that every person carries the potential to transform society and bring change to their environment. She will be sharing her experience of overcoming emotional and mental barriers through art. Kevin Ledo an artist primarily focused on mural installations and fine art paintings, based in Montreal, Canada. He is the face behind the Leonard Cohen mural in Place des Arts in Montreal!